Wide-angle focal lengths are vital in those shooting scenarios where you can’t get any further back, and if you regularly shoot landscape, architecture or group portraits, having a decent-quality wide-angle lens is essential. Standard zooms covering wide-angle to short telephoto focal lengths are great for versatility, but the wide-angle end of the zoom is often optically weak, offering poor edge sharpness, heavy corner shading and noticeable chromatic aberration even with the aperture stopped down. Primes on the other hand often perform better, and there’s a large range of both own brand and 3rd-party 35mm options to chose from. We’ve tested 7 just for the Canon EF lens mount and noticed a big variation not only in price and features, but crucially in optical performance, with some fairly surprising results. So if you’re in the market for a good quality wide-angle lens, read on as we round up the DxOMark Lens Scores for Canon EF 35mm primes. All these EF mount 35mm primes offer a “fast” maximum aperture, but only the latest Canon offers image stabilization. With wide variations in price from $320 through to a whopping $1843, are you getting what you pay for? Alongside the recently-released Canon EF 35mm f/2 IS USM two third-party options from Sigma and Carl Zeiss make it on to our winners podium for 35mm EF mount lenses. The Sigma 35mm f/1.4 DG USM A Canon just barely steals the spoils from the Canon EF 35mm f/2 IS USM, with a DxOMark Score of 30 compared to 29 and surprisingly, both knock the $1843 Carl Zeiss down into third place. 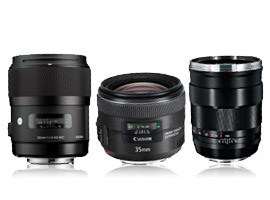 All three are great lenses, but let’s get picky and dissect the results to see what you get for your money. Two 3rd-party options together with Canon’s latest wide-angle prime make the podium for 35mm Canon EF mount lenses, and Sigma’s 35mm f/1.4 DG HSM A steals the top spot with a DxOMark score of 30. Sigma has done something special with the 35mm f/1.4 DG HSM A, producing a lens that equals or betters most scores by the Canon and Carl Zeiss alternatives. Scoring 17 P-MPix for sharpness, it’s one of the sharpest lenses tested by DxOMark for a Canon mount, and with a transmission score of 1.5TStop, it’s the brightest EF mount 35mm prime, too. Only in vignetting does it fail to excel, with a 2-stop fall-off in the corners at the maximum aperture, although it is only very marginally behind the Canon 35mm f/2 IS USM (–1.8Ev). Distortion and chromatic aberration results are also among the best, and it’s pleasing a manufacturer recognizes the demand for optics that provide good bokeh. In terms of features, Sigma’s HSM autofocus motor ensures quick and quiet AF as well as compatibility with entry-level DSLRs, but there’s no image stabilization. Wide open, it’s sharp in the center but does drop off in the corners. Closed down to f/4, there’s great edge-to-edge sharpness and while at f/16 results are softer, they’re still homogeneous. While vignetting is heavy at f/1.4 and encroaches into most of the frame, it is quickly addressed by stopping down to f/2, and by f/4 the problem is resolved completely on the Sigma. Despite achieving the same 17-PMpix sharpness and 6um chromatic aberration scores as the Sigma, Canon’s recently-released 35mm prime simply loses out to the Sigma in the overall rankings with a DxOMark Score of 29. A transmission score of 2Tstop compared to 1.5TStop for the Sigma means that the 3rd-party option is 0.8 EV brighter, and that combined with a slightly worse distortion score for the Canon is enough to give the Sigma the edge. With only a marginally better vignetting score than the Sigma at –1.8Ev, the Canon 35mm still displays heavy corner shading using the maximum aperture, but this is to be expected with wide-angle optics and can be corrected in post-production. If you’re interested in image stabilization, then this is the lens to go for, though, as it’s the only lens in the test featuring technologies to counter the effects of camera shake. Good center sharpness at f/2 is offset slightly by relatively steep drop-off in the corners, although by f/2.8 results are better; stop down to f/4 and something approaching homogeneous sharpness is delivered. At f/2 and f/2.8, some post-production vignetting correction will be required for a pleasing image, but from f/4 onwards the effect is controlled better. With a reputation for optical excellence, it’s somewhat of a surprise that the Carl Zeiss option is a little off the pace and slips into 3rd with an Overall Score of 27. Although still a good lens, with a hefty $1843 price tag we expected more in terms of optical performance. Despite similar results for transmission, distortion and vignetting compared to the leading Sigma, an overall sharpness score of 15 P-Mpix is disappointing for such an expensive lens. At the maximum f/1.4 aperture only the very center of the image is sharp, and you’ll need to stop down to f/2.8 to get something approaching good homogenous sharpness. What you’re paying for is outstanding build quality, however, which means lenses like this will last a lifetime and hold their value on the secondhand market, too. It also makes them a joy to use, with an excellent focus ring for precision manual focus … but this lens doesn’t include autofocus, let alone image stabilization. Good sharpness isn’t possible at f/1.4 aperture and even at f/2, the Carl Zeiss isn’t as sharp as the Sigma at f/1.4. For good homogeneous sharpness you need to stop down 3 stops to f/4, which is disappointing for a $1843 prime lens. Vignetting performances between the Carl Zeiss and Sigma are more comparable, however, with heavy shading at the maximum aperture (resolved by f/4). Canon EF 35mm primes: Are there any bargains? The problem with wide-angle primes is that they’re expensive, and at $850 even the cheapest of our top-ranking EF mount 35mm primes will be out of financial reach of many photographers. There are a couple of cheaper options on the market, however, in the shape of the Canon 35mm f/2. The $320 Canon EF 35mm f/2 is a no-frills lens that’s been around since 1990 and doesn’t offer the image stabilization or USM autofocus motor of the updated version. With an overall DxOMark score of 22, it also trails behind the more expensive competition, but with a respectable 15 P-Mpix for sharpness, it actually equals the performance of the $1843 Carl Zeiss, making it our top “value for money” option. Of course it’s not without its faults: wide open, both sharpness and vignetting are quite poor, and a transmission score of 2.3TStop means this lens is 1.2 stops darker than the Sigma 35mm. A vignetting score of –1.9Ev is also the worst in the group, but considering its relatively good sharpness for such a cheap wide-angle prime, these are limitations many photographers will be happy to live with. Although overall sharpness is very respectable for a lens at this price point, edge softness at the larger apertures is a problem and it isn’t completely resolved until you stop down to f/4. Poor vignetting performance at the wider apertures prevails. At f/2, shading encroaches into most of the frame and even stopping the lens down doesn’t completely solve the problem, with some shading visible at all apertures. Well, the good news is that there are lot of choices for EF mount 35mm primes, although the bad news is that all the decent ones are a little expensive. Sigma pulled a beauty out of the proverbial bag with its 35mm f/1.4 DG HSM A Canon that offers great optical performance, a large f/1.4 maximum aperture, and top bokeh. If you have a $850 budget and can live without image stabilization, there’s no question that this is the best 35mm EF-mount prime. If you want image stabilization, however, Canon’s 35mm f/2 IS USM is the lens to go for as it’s the only one featuring anti-shake technologies. Price-wise, it costs about the same as the Sigma and has a similar optical performance, but only opens up to f/2. Although 3rd on the podium, it’s difficult to suggest any compelling reason to spend an extra $1000 to buy the $1843 Carl Zeiss. I’m sure as an object it’s a thing of beauty and incredibly well made, but it lacks the features of the other two and isn’t even as sharp. If you’re after a bargain though, go grab the $320 Canon EF 35mm f/2. It’s been around for a while, doesn’t feature the bells and whistles of the latest version, and its performance wide open at f/2 leaves a little bit to be desired. Put that into the context of around a $530 savings now that the updated version is out, however, and many photographers will agree it’s a cracking little 35mm prime for the money.